That engine was the Cleveland 351 V8 by Ford. The power was transmitted via a ZF trans axle gearbox, which apparently was noisier than the engine, at least in early cars. From the cars introduction in 1970 to its final production in 1992, the car went through a huge number of changes. It started production as a clean wedge design, and finished as a bespoilered monster that bore little resemblance to the original. Also, US versions differed due to emissions and safety regulations. The version modelled here is a 1977-ish Euro spec car. It has grown a massive rear wing, but is still otherwise the original design. Late in 1971, Ford began importing Panteras for the American market to be sold through its Lincoln Mercury dealers. The first 75 cars were simply European imports and are known for their “push-button” door handles and hand-built Carrozzeria Vignale bodies. A total of 1,007 Panteras reached the United States that first year. As with most Italian cars of the day, rust-proofing was minimal and the quality of fit and finish on these early models was poor with large amounts of body solder being used to cover body panel flaws. Subsequently, Ford increased their involvement in the production of the later cars with the introduction of precision stampings for body panels which resulted in improved overall quality. Ford ended their importation to the US in 1975, having sold around 5,500 cars. 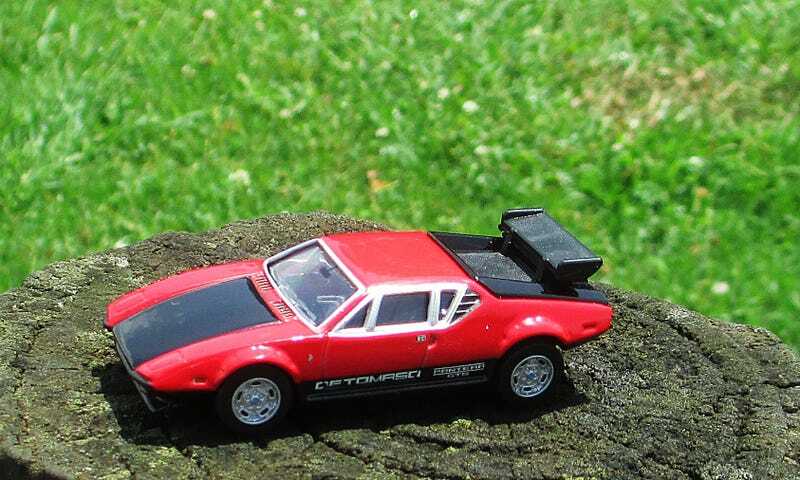 De Tomaso continued to build the car in ever-escalating forms of performance and luxury for almost two decades for sale in the rest of the world. After 1974, Ford US discontinued the Cleveland 351 engine, but production continued in Australia until 1982. De Tomaso started sourcing their V8s from Australia once the American supplies dried up. These engines were tuned in Switzerland and were available with a range of outputs up to 360 PS. The model you see here is a Tomica “Limited” model from 2003. But the casting goes back a lot further to 1978 when it was first launched as an “F-Series” model. It stayed around until 1983 or so. The “Limited” treatment includes more tampo detail, bespoke wheels with rubber tyres and painted engine detail. Simpler versions of this casting have since popped up as a special release here and there, and it is definitely one to track down if you like this car.